HOT VIDEO of Adam Lambert at Miami Gay Pride! You are here: Home / Tours and Live Performances / 2013 "Non-Tour" Tour / HOT VIDEO of Adam Lambert at Miami Gay Pride! We’ve been looking forward for weeks to video of Adam Lambert performing at Miami’s Gay Pride Festival, and it’s finally here! This show was quite a change from Adam’s regular tour stage explosions. He had his two male dancers (good friends Terrance D. Spencer and Johnny Rice) but no band or Vajayjays to lend back-up voices. There was a DJ behind him on the small stage, perhaps monitoring the musical tracks he was singing to? Please let us know how you liked the show! A big thank you to thelambrits.co.uk for the picture and JuanCubaNation for providing this video. What is the Q again in LBGTQ? I should know and I know it’s not Queen. It was fun to watch the video. I wish Adam big things for the future. He should be as popular as any of those big pop singers. As a Lesbian woman and a Glambert, I am so proud of Adam! I have been a huge fan since his first audition on American Idol,been to several of his concerts, and I loved this one just as much! Love you Adam!! I was fortunate enough to be at this concert And get a spot right up near the stage. Adam was fantastic as usual. Being up close to the stage is an experience like no other. I hope I get that opportunity again & again! It was a fun evening: beautiful Adam & beautiful audience. I’d love to know, how was the crowd’s response to him? I’m sure there were a lot of Glamberts but I’m hoping there were a lot of new fans in the audience too. Has his popularity increased in the LGBTQ crowd? 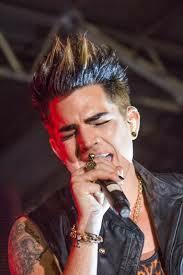 I have been a fan of Adam from the first time I saw him on Idol. I am a 71 year old grandma and great grand ma. In 2009 I suffered a ruptured appendix and was not expected to live. While in ICU I tried to get Fox on the TV and they did not carry that station. My daughter kept telling me to fight I had to be able to get well. Needless to say I am so happy to be here. My daughter took me to see Adam in concert in Houston, TX I loved it. He is a wonderful man and I support his charities and commend his efforts to stop Bullying. You kept it up Adam and may all your wishes, prayers, and dreams come true.